Take a guess at how Bitcoin works. Yes, it’s cryptocurrency, but do you have any idea why it’s so secure? Why do people like it so much? In June 2013, Bitcoin exchanged at 1 bitcoin to $100 and following a meteoric rise traded at $17,900 in December 2017. Why do people like Bitcoin so much that its value increased 17,000 percent? Bitcoin is set to change the world’s financial landscape and it’s all thanks to blockchain technology. But it’s not only Bitcoin. Blockchain looks ready to change the internet as we know it. Anonymity and a Napster-like internet are just around the corner. What if we didn’t rely on central servers, but instead on our own computers? What if all internet transactions were transparent and fixed? Ecommerce businesses, especially, will enjoy the rise of blockchain. Your ecommerce brand needs to embrace blockchain. The technology will keep you ahead of the competition while endearing consumers to your brand. First, let’s look at the idea behind blockchain. Think of blocks like a records book. Another block (page) gets added to the chain (book) every time something happens. The collection of blocks forms the blockchain (book). The idea comes from combining several leading web technologies. Think of combining Google Docs, torrenting, VPNs, and more. Sound too good to be true? It isn’t. Blockchain takes these technologies’ best aspects and creates something revolutionary. Each block is both publicly and privately available. People with “keys” (number strings) can edit their private information and view others’ public information. Think of it like sharing a Google Doc. You can edit your own documents but only view others. For Bitcoin, the blockchain is a digital ledger. Your Bitcoin is really an address (number) on the chain. A key (password) grants access to that address and thus your cryptocurrency. After every transaction another block gets added. Each new block details each new transaction. The entire chain being your ledger. 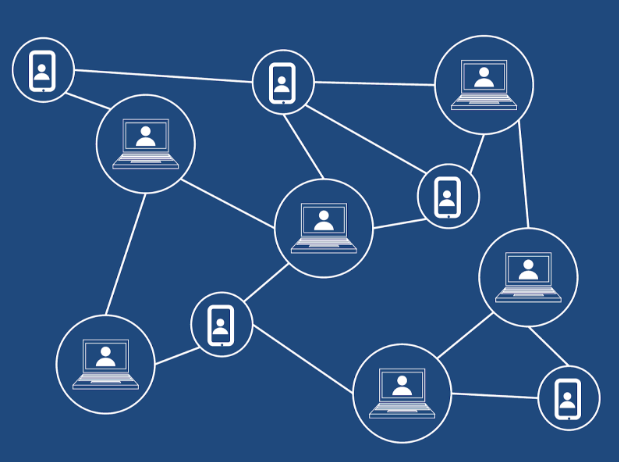 Peer-to-peer technology means that blockchain resides on every participants’ computer. Everyone “stores” part of the chain and the chain has no centralized home. Users can see every addition in real-time. Like torrenting, each computer “hosts” small pieces of the blockchain. The P2P technology makes blockchain a secure, anonymous way to track information. No one can edit information once it’s written to the chain because no single person has the entire chain. Ecommerce and blockchain are building towards a love-hate relationship. Some proponents want blockchain to dismantle ecommerce businesses as we know them. In theory, people could host private P2P marketplaces. However, without financial incentive, no one has a reason to design those marketplaces. Instead, blockchain gives traditional ecommerce security, transparency, cost cutting, and supply chain management. Not only does blockchain improve your business, it also keeps your customers safe. Instead of searching for new business models, we can improve what we have. Every business wants privacy for their consumer. People overwhelmingly care about internet privacy but think privacy is impossible. Blockchain is here to save the day. Blockchain’s decentralized nature helps improve your storefront privacy and transparency. Consumer interactions become transparent. Blockchain provides a real-time transaction ledger. When someone makes a purchase their information becomes part of the chain. Instead of storing customers’ names, user data, and IP address, consumers are just an address on the blockchain. Each consumer gets their own address that relays non-identifying information. For instance, consumer #12345 consistently purchases toothpaste and also browses for shoes. Personal information isn’t shared but your business can still follow consumer trends. Your advertising won’t suffer. Has your supply chain ever fallen through? Products that went undelivered? Or maybe products that didn’t arrive as promised? Did you receive different products altogether? Blockchain solves all these issues and more. Blockchain technology also works as a supply chain ledger. The P2P technology allows your company to track supply chain records, from inventory to payments, to product origin. You’ll never miss another shipment. It’s easiest to think in terms of different scenarios. The food industry uses blockchain to track the origin of meat. Every shipment enters the blockchain. P2P transparency makes it impossible to falsify the meats’ origin, storage, sell-by-date, and more. The mining industry uses blockchain to track their minerals from start to finish. The chain can track when minerals get mined, shipped, finished, shipped again, and finally sold. Every part of the chain (suppliers, manufacturers, etc.) is in tune with every step of the process. Your ecommerce store can use blockchain much like the mining industry. The technology will help track your own supply lines from the product manufacturing process to your warehouse. You not only ensure your product arrives on time, but also that you’re getting what you ordered. Every business wants to save money. If you don’t, you won’t make it very far in today’s world. ROI is crucial. Blockchain reduces costs for many of the same reasons it excels as a supply chain ledger. In fact, the reduced costs come from added security, transparency, and communication. Your business won’t need staff to track your supply chain, thanks to real-time ledger updates. You won’t need staff to monitor and update information, product manufacturing times, shipments, and more. Likewise, you won’t need staff to test your products to ensure they’re genuine. With blockchain, if a producer says the product is from China, you can trust it originated from China. Blockchain helps reduce your quality assurance expenditures. Have you ever looked at your credit card transaction fees and wished they’d just disappear? It’s safe to say most ecommerce storefronts would love to get rid of payment system fees. After all, the more money saved, the bigger your return on investment. Blockchain-based payments (think Bitcoin) will eliminate those pesky payment system fees. There’s a newer, better way to accept payments that completely bypasses the transaction companies. The new system fundamentally changes the ecommerce payment landscape. Today, ecommerce payments happen through online platforms (PayPal, etc.) or credit card transactions. Either medium charges the seller (you) fees starting around 2-3 percent. Blockchain changes that entire system. A blockchain-based payment ledger places payments directly on the blockchain. Without a middleman, your ecommerce store doesn’t pay transaction fees. Every transaction happens on the chain. Third-party companies are already offering solutions to build ecommerce businesses their own blockchain. Your business would then exist as an address on the chain, as would consumers using your ecommerce store. P2P transactions would happen on the blockchain network, without any middleman. Sometimes customers wait too long to return products. Likewise, sometimes consumers request service after a product’s warranty expires. But both receipts and warranties are difficult for ecommerce businesses to track. With blockchain, warranty and receipt information gets added to each “block” and stored on the chain. Again, the blockchain acts as a real-time transaction ledger. Your company can easily provide receipt or warranty information when customers ask. Easy access to receipt and warranty information protects against consumers trying to return or fix out of warranty items. Blockchain technology is set to revolutionize the ecommerce world. Building your own blockchain brings an unrivaled blend of safety, security, transparency, cost savings, and more. We’ll soon see the ecommerce world shift. Blockchain’s progress will soon force companies to implement blockchain into their ecommerce business. While it’s not necessary yet, utilizing blockchain will give you a competitive advantage. But blockchain isn’t readily available. Most ecommerce platforms aren’t designed to implement the technology. Implementing any type of blockchain requires reworking your company’s entire backend technology system. Put another way, implementing blockchain isn’t easy. Even if you do want to try your hand at implementing blockchain technology, do you have anyone on your team who knows how to design a blockchain; anyone with any blockchain knowledge, at all? Most ecommerce businesses aren’t blockchain savvy. Your won’t find any blockchain experts among your staff. If you’re ready to join the blockchain revolution, you need third-party help. First and foremost, you need an ecommerce platform that works with blockchain technology. Something that doesn’t require restarting your entire business. That’s where we come in. Our ecommerce mobile app supports both storefront migration and third-party blockchain implements. Once you’ve integrated into the Mofluid platform you can use third-party blockchain providers. The providers create your blockchain and connect it into the Mofluid platform. Our staff works with third-party blockchain companies to ensure your blockchain works smoothly. So if you’re ready to get started setting up your own blockchain friendly ecommerce store, try MoFluid today. Our team will work with your business to help create the best ecommerce storefront for your needs. We strive to help your business stay on the cutting edge of ecommerce technology.